This card is entered into this week's Crazy Crafters' Project Highlights - do visit to look at the other great projects and vote for your favourites. My husband sees (and admires, because he's a good husband!) all the cards I make, so I wanted to make his birthday card really special! I started out by searching my array of stamp sets for something masculine, my eye was caught by the Seaside Shore set and my brain started playing little word games "Fischer", "Fish" - I can't help being a bit crazy! Just swimming by to say hello! I remembered seeing a few "gel" cards on Pinterest (France Martin has a good tutorial) and thought I'd try a variation. 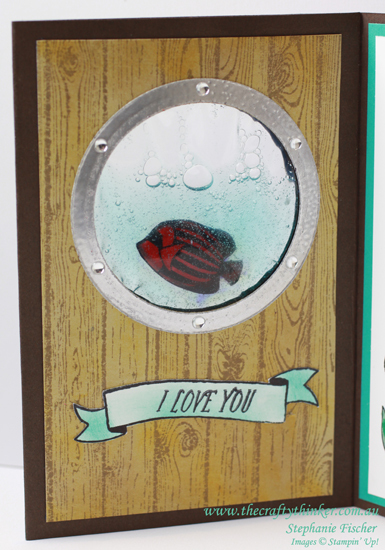 I put the fish in the "water" and suspended it in a "porthole"
Yes, the fish is inside the gel! My husband loved his card! I could see that the swimming fish really intrigued him - he kept playing with it! 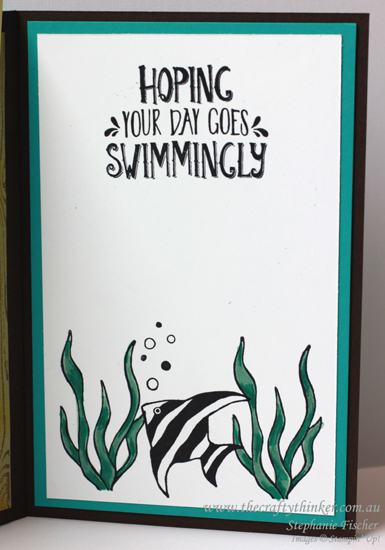 I kept the inside of the card quite simple to offset the drama of the swimming fish. I don't think I'd send a card like this through the mail (unless it was very well padded and protected!). See my comments below about putting the fish in the gel - it's a work in progress. I cut a 12" piece of Early Espresso in half to 6" x 12" and scored it at 4" and 8". I then folded the left edge over and that formed the double thickness front of the card and cut the "porthole" with one of the Layering Circles framelits. I then used the same circle framelit and one a couple of sizes larger to cut the metallic frames for the porthole. Silver Foil card would work fine but I heat embossed a piece of cardstock with silver and used that. I made two "wooden" panels by using Tip Top Taupe ink and the Hardwood stamp on Whisper White cardstock. I then sponged with Crushed Curry and Crumb Cake inks. One at a time, I positioned the panels and drew a pencil line around the hole. I used the pencil line to line up the circle die and cut the hole. I then adhered these panels - using dimensionals for the front of the card. At that point, I added the frames I had made and finished them with some of the Metallic Enamel dots. The banner on the front used the Thoughtful Banners bundle. 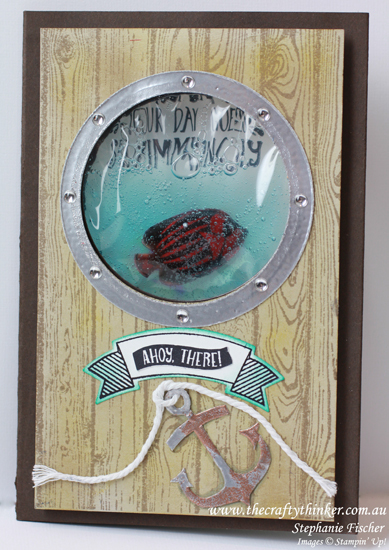 I stamped the "Ahoy There" banner from the Seaside Shore set and snipped around the centre piece which I stuck into the Thoughtful Banner. I edged the banner with Bermuda Bay ink. To make the anchor, I stamped it onto Whisper White cardstock and fussy cut it. I then covered it with Versamark and heat embossed it with Silver embossing powder. I added a couple of sprinkles of Copper embossing powder and finished the heating. I tied some of the Whisper White Thick Bakers Twine through the top of the anchor and glued it all on the front of the card. The banner on the inside of the card is from Banners For You Bundle. I cut a piece of Bermuda Bay cardstock to 3.75" x 5.75" and layered onto it a piece of Whisper White cardstock 3.5" x 5.5" which I had stamped and coloured. I glued this panel to the inside of the card. I stamped, coloured and cut out a fish and then clear heat embossed it very thoroughly all over, including all the edges. I placed the fish in a small zip lock back with some aqua coloured gel (I didn't have any hair gel so I used shower gel). I placed Foam Adhesive Strip around the porthole (on the back of the card front) and gently stretched the zip lock back over it. I finished securing the bag with sticky tape and then used Fast Fuse adhesive to glue the two sides of the card front together with the zip lock back in between. I was concerned that it would look odd and bulgy - but it works OK for me. To avoid the bulge, you could add a small gusset to the sides of the card front. This is still a work in progress for me! My first attempt at putting the fish in the gel was a total disaster! I knew I would have to seal the fish and tried a really heavy coat of glue using the Fine Tip Glue Pen and leaving it to dry overnight. It looked great for about four hours and then the ink started to leach out of the fish and I was left with an amorphous blob in red gel! What you see in the photograph is Mark II. At that point the fish had been in the gel for about 24 hours. If you look carefully, you can see there is a little discolouration of the gel. As I write, the fish has now been in the gel for three days and some more ink has leached out. It's not too bad but definitely not perfect. More experimentation is required! I'm going to see whether Hair Gel would be kinder to the fish than the Shower Gel. 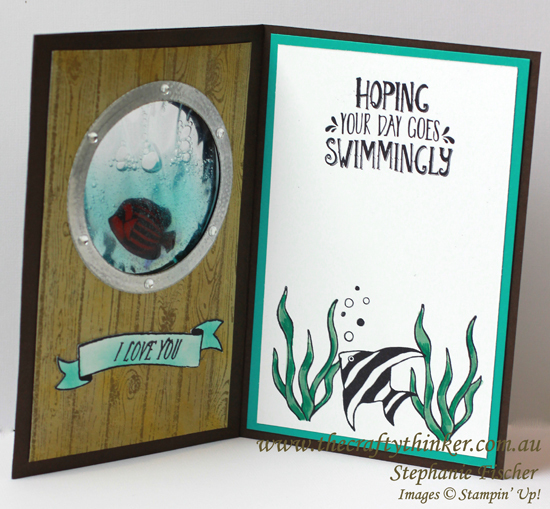 If not, I plan to try stamping the fish onto coloured plastic with Stazon.